Needless to say this week was not my greatest triumph. Oh well; next week is rest week too and then after that hopefully I can start getting back to normal. I decided, in anticipation of the marathon, to do NONE of my regular exercise this week. No training runs, no walks, no ballet, the idea being this would allow my IT Band to heal. This was also expo day! I left work early and drove to the Baltimore Convention Center where a decent expo spread was set up. I liked a lot of the Under Armour official race gear but nothing I liked was still available in my size. Nothing much else struck my fancy. The one booth I did hit up was KT Tape. Most of the employees had been siphoned off to the Marine Corps Marathon expo, so there was only one guy working the table. And man, was he HUSTLING. He was taping legs and selling tape like nobody's business. If he wasn't being paid double he should be. 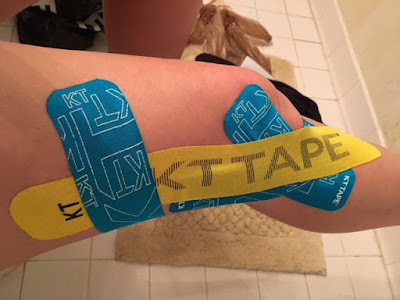 I had him tape my IT Band and he did it slightly differently from how to KT Tape YouTube video recommended, but I ended up liking it a lot better and it held up great during the race. Also he told me I had very soft skin, which in the context of his earnest disposition was sweet but out of context is something a serial killer would say...? As previously established: bad news bears. And I still think it's weird that my GPS logged so much more mileage, but what can ya do. I spent the night at my parents' house before the race, and while there I dropped off a bag of Disney clothes for my mom to try on - White Rabbit and Eeyore tees, a Minnie tank, even my Cheshire Cat dress. When we go in December, I want her to get into the spirit of the thing! We'll see how willing she is to cooperate, of course; REAL adults can be strangely resistant to tapping into fantasy dressing. I, being a sub-adult at best, have no such qualms. The important thing to remember is that it's Walt Disney World and you can be as childlike as you want. - Fairytales & Fitness recaps the relay version of the Baltimore Marathon. - Just Me & My Running Shoes runs the Castaway Cay 5K. - The Disney Tourist Blog takes a tour of the Cinderella Castle Suite. - Djambo Everyone highlights how the Maharajah Jungle Trek creates a story with the crumbling palace. - easyWDW reviews the new Baseline Tap House in the Studios. I am intrigued! - This Fairytale Life assembles a group of adorable Disney-themed tote bags. - The Tomorrow Society selects the best and worst Epcot queues. It’s athletic tape with stretch, so it supports your muscles while still allowing you to move. Invaluable when you need to run on a slight injury!